Wall anchors in South Dakota, Wyoming, and Nebraska are products that are used to help stabilize cracking walls or bowing walls. This type of issue usually occurs when the pressure from the soil begins to push on your foundation walls. Using these plate anchors and wall braces to repair bowing walls is a more economical way of repairing them without the need to completely rebuild the wall. The wall braces and plate anchors are used to bring your walls to a more horizontal level. Normal foundation walls are built to withstand a certain amount of pressure and when that is exceeded, you will begin to notice your walls starting to bow, leading to serious problems for your home. 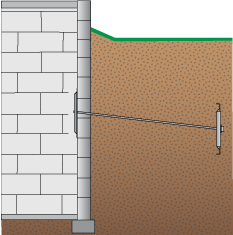 A wall anchor is a plate, usually 2’ by 2’, that is bolted to your basement wall by means of a rod and held in place by a bolt. A hole is drilled through the wall, and a trench is dug into the yard. The rod goes through the wall and the trench and is connected to another plate that is situated in the ground up to about 10 feet away from the wall. The dirt won’t move, so the plate in the yard will stop the plate in the basement from moving. The bolt can be tightened a little bit every month or so, theoretically putting more outwards pressure on the wall, so the wall can start to move back toward a straighter position. This type of system is generally used for temporary wall support, repairs on your basement walls, retaining walls, or seawalls, and also used for shoring. 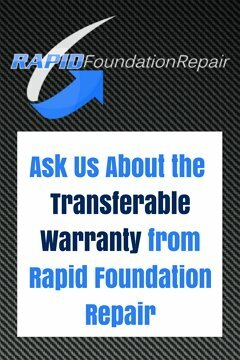 Here at Rapid Foundation Repair, we only use Earth Contact Products, the best products for foundation repair. We guarantee our top quality products and dependable services will provide you with a lasting fix for your foundation repair needs. Ignoring bowed walls can lead to bigger problems in the future. If the wall cracks, foundation leaks, or misaligned doors and windows are left unattended, they could decrease the value of your home dramatically, and threaten the safety of your family. Mold and mildew growth harms your possessions and the air you breathe. Contacting the professionals here at Rapid Foundation Repair for your foundation repair needs can correct the damage and prevent further damage to your home. Contact Rapid Foundation Repair today for your foundation repair needs in South Dakota, Wyoming, and Nebraska.